Photograph depicts group of men and women standing on front steps to unknown building. 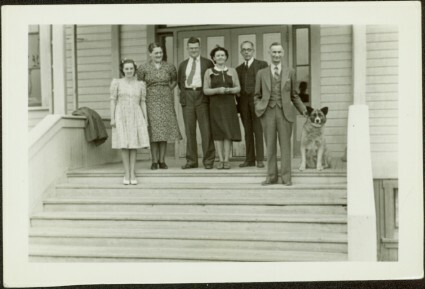 Sarah stands second from left, Bert stands on far right with dog. Item is part of the Taylor-Baxter Family Photograph Collection. See also items 2009.5.2.305 - 2009.5.2.314 for images featuring similar content.